Letters to a Young Librarian: Wherefore Art Thou Surveying? I try to start any endeavor at work by asking myself why I'm doing it. Sometimes, the answer is easy to find. Paying the ProQuest bill means continued access to a resource my community uses a lot. Building a circulating board game collection supports members of my community beyond the classroom (or even inside, depending on the professor). So you can be sure that when I decided to create a survey, I had very specific goals in mind. But probably not the ones you think. Surveys seem easy to create and conduct, but they're not. 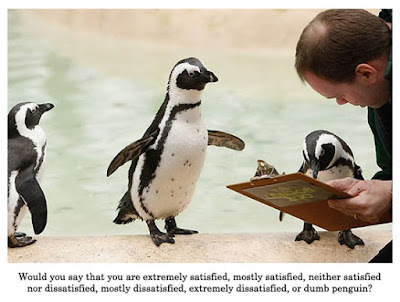 Even if you can avoid leading questions, remember to align your Likert scale carefully, and design the survey in such a way to elicit a solid response rate, there's still so much you miss. You'll want to know why people answer certain questions the way they did, but also how important things are in context. Maybe someone thinks the library is super helpful, but they haven't been there since their freshmen year or since they got tenure or since they got a new job. And yet, I still run surveys semi-regularly. I don't expect to learn a lot from the surveys themselves; instead, it's about starting a conversation. I sent a survey out to the faculty of my school towards the end of last semester asking about research assignments and library resource use and outside resources. I do care that kinds of assignments and resources are being used, but I knew that - even with a desirable prize possible (a $10 gift card to Wawa) - the return rate wouldn't be that great. Survey fatigue and high teaching loads were conspiring against us. But it did exactly what I'd hoped: it gave me a new way to start discussions with faculty. I sat down, one-on-one, with each of the respondents. Since there were fewer than a dozen of them, it was relatively easy for me to find the time. Even if there had been more, I would have figured it out because those conversations were invaluable to me. I've been, slowly & steadily, building relationships with the faculty at my institution - both adjunct and full-time faculty. It's true that the group who completed the survey was mostly made up of the same people who always respond to library requests, but there were a few with whom I'd only had passing conversations. Even better, although I predicted 90% of what the faculty said to me when we talked, in each conversation I learned one new thing that hadn't been part of my thinking previously. Best of all, though, we got these faculty members thinking about the library as a resource for their teaching - not just for the students. We got them thinking about ways to improve the library. We got them thinking about the services and resources we provide. And we got them thinking about how the library can support the whole community. So, to bring this back to where I started: wherefore art I surveying? It's not assessment; it's marketing. How about you? Have you ever used surveys for marketing? How so?